When are Police or Emergency Medical Personnel Allowed to Avoid Certain Traffic Laws? Any “publicly owned vehicle” used as follows: (a) by “any federal, state, or local agency or department, or district employing peace officers”; (b) forestry or fire department vehicles; (c) public vehicles equipped and used either for fighting fires, or towing or servicing other vehicles, caring for injured persons, or repairing damaged lighting or electrical equipment; (d) any state owned vehicle used in responding to emergency fire and rescue calls; (e) U.S. Federal Agency vehicles used for emergency response, fire fighting or life saving; and (f) any other vehicle commissioned by the CHP with an authorized emergency vehicle permit. Is it Possible to Bring a Claim for Personal Injury or Wrongful Death Against the Driver of an Emergency Response Vehicle in California if They Crash Into my car? Because the law protects the activities involved in providing emergency services such as police pursuits or exigent circumstances, it is important to have a lawyer analyze the facts of any particular crash to determine if (a) it truly falls under this exemption; and (b) despite the exemption, there is still civil liability for payment of money damages to the victim due to a lack of reasonable care and negligence on the part of the public employee. It should be further noted that the time deadlines (so-called “statutes of limitation” are much shorter) for claims against public entities. An injured party or the surviving spouse, parent or child of a wrongful death decedent usually has a mere 6 months to file a “Government Tort Claim” to put the public entity on notice of a pending action. Time deadlines vary from there depending upon the response (or lack thereof) to the initial claim but, a lawsuit must be filed in court within a fairly short time frame following a rejection or failure to respond to the out of court ‘Govt. Tort Claim’. This makes it CRUCIAL to not only consult with a lawyer but, to do so AS SOON AS POSSIBLE following this type of incident. Our office recently represented an individual stopped at an intersection on his way to work. A Los Angeles County Sheriff deputy, coming off a double shift, fell asleep behind the wheel of his cruiser and collided into the back of our client causing serious back injuries including a herniated disc requiring surgical repair. The analysis here was that the officer was not in fact en route to an emergency with flashing lights and sirens so the exemption did not apply. Under California Government Code 815.2, L.A. County was liable for the negligent acts of their employee and we were able to obtain a substantial six figure settlement for the victim. 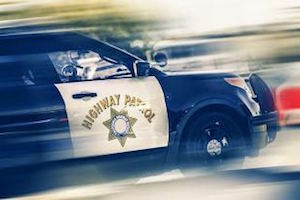 If you are involved in a traffic collision with a police car, fire truck, ambulance or any other emergency vehicle anywhere in California from San Diego to Orange County to the Inland Empire and up through Central and Northern California, call our office toll free at 866-966-5240 for a free contact us on your legal rights!